The unique comedy series “GLOW,” returning for its second season tomorrow, June 29th, feels smarter, timelier and more confident than it did in its first year. The idea that a show about female wrestlers in the ‘80s would develop into something more than a gimmick might not be believable to some of you, but trust me when I tell you that this is fantastic television—funny, clever, and with as much to say about #MeToo as ‘80s fashion. A trio of performances that I thought were good enough in season one to warrant Emmy nominations from Alison Brie, Betty Gilpin and Marc Maron are even better in season two. Looking at the season as a whole, it’s easy to pick out a few subplots that don’t work, but they're easy to ignore on a good show that's only gotten better. At the end of the first season, the show within a show had become something of a success, reuniting friends-turned-enemies Ruth (Brie) and Debbie (Gilpin) as antagonistic wrestlers named Zoya and Liberty Belle. The second season starts with “GLOW” trying to figure out what’s next. There are power struggles between the three leads as Ruth clearly cares the most about the project—and likely knows the most about how to make it a success—but can’t break through Sam (Maron) and Debbie’s macho control issues. Sam has to be the only voice of authority on the set and Debbie insists on being made a producer, ostracizing her even further from the rest of the ensemble. And Debbie continues to struggle when it comes to leaving her personal life at home. Her divorce is emotionally pulling her apart, and she still blames Ruth for much of that pain. The show is incredibly smart when it comes to how gender and societal constructs dictate power. Sam is the "man" in the room and, therefore, the final voice, while Debbie considers herself superior to Ruth in every way, and always has. As the show within a show continues to go through growing pains, the writers of “GLOW” use the opportunity to comment on gender roles in the workplace and in popular entertainment. For the most part, these themes are subtle, underneath the narrative of the season, but the writers take on a part of the #MeToo movement directly in episode 5, which mirrors the Harvey Weinstein stories of “meetings” in hotel rooms and unwanted advances. And yet it doesn't feel forced. “GLOW” works so well because of how deftly it weaves its serious subject matter into a story of woman playing exaggerated characters on a late-night wrestling show. It’s not a coincidence that Sam is a former B-movie director. At their best, the B-movies of the ‘70s often countered their exaggerated elements with true social commentary. “GLOW” does some of the same, finding ways to be both remarkably goofy and heartbreakingly genuine in the same beat. The season premiere, directed by Lynn Shelton, and the best episode of the series to date (204), co-directed by John Cameron Mitchell, are marvelous balancing acts of tone. That balance isn’t always consistent. There’s a constipation subplot in episode three that comes out of an inferior show, and it still feels like the supporting cast is often underdeveloped. It’s a crowded series. Whenever Sam’s daughter pops up for a plot point, you’re reminded that she hasn't been developed into a three-dimensional person yet. There are a few of those faces, and it would be nice to get to know some of the bit players more—a subplot involving “Welfare Queen” in episode four is fantastically done. Although anything that takes screen time from Brie, Maron and especially Gilpin sometimes feels like a distraction. Gilpin was very good in season one but she’s even better in two, daringly sketching a character who’s not always easy to root for. It’s one of the best performances of the year so far. More than most shows that I recommend in my role as a TV critic, “GLOW” seems to be a tough sell. It’s the concept, which sounds like one that could run out of ideas in an episode or two. 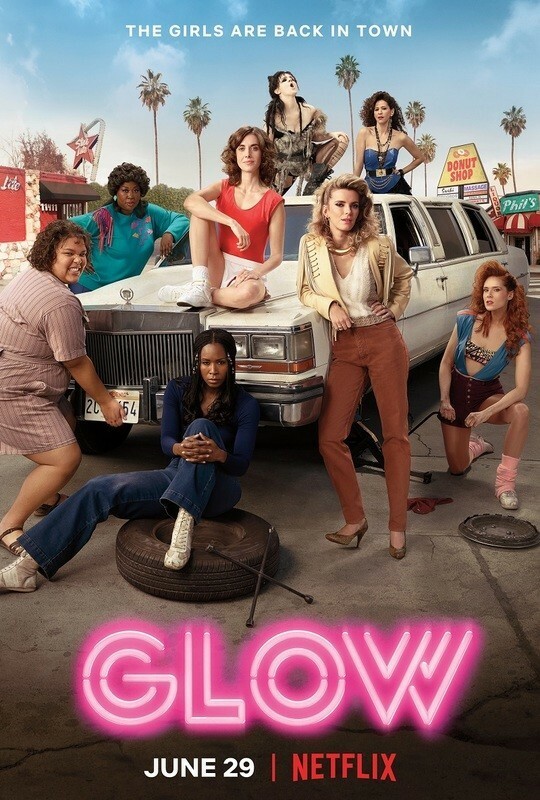 But “GLOW” is about ladies wrestling in the same way that “The Office” is about selling paper supplies—it’s the ensemble comedy and characters that we come to know and love that make it work. It’s one of TV’s best comedies.